Ah! This one actually gave me a fright. I’m starting to build up quite the collection of skull fish tank ornaments on this site. Maybe because I’m a bit creepy myself. I just think they look really cool. And so should you! Plus it makes your fish seem more unusual. And you can make some stories up about your fish. Why not say that your fish was actually friends with that T-Rex, and has been inseparable from his skull since he passed away millions of years ago. Because your fish is a time traveller. Dr Who style. I dunno. I’m currently sitting in my underwear writing all of these product descriptions. That’s all you need to know. This may be cool, but unfortunately it’s not real. I know, I’m sorry guys, I’ve let you down again. But imagine if it was real, It would be worth far more than what it is selling for. And you guys would be famous. Then you could buy loads of fish tank ornaments. That would be awesome huh. 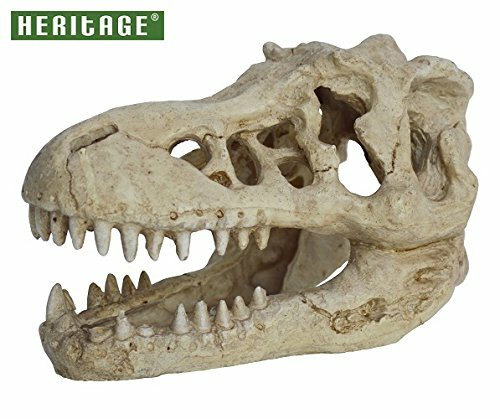 If you’re still feeling disappointed by the revelation that this skull is not real, why not read some recent reviews and comments to reassure yourself that this t rex skull is indeed fantastic. Click here to see a collection of some recent reviews.